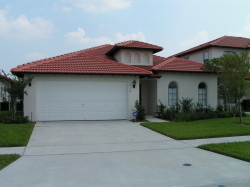 This beautiful 4 bedroom 3 bath luxury villa, brand new for 2005 is situated in the Mediterranean styled gated community of High Grove. It is superbly furnished to a deluxe standard and would be ideal for families or group�s of adults, being able to accommodate up to eight in comfort (with an extra two sleeping on a sofa bed if required) and has its own private screened Pool and integral Spa for those lazy evenings you just want to relax and watch the sun go down. The Villa has 2 Master bedrooms with king size beds, walk in closets and en suite bathrooms with a further 2 twin bedrooms with walk in closets sharing a central bathroom. Both Master suites have direct access to the pool area. There is also direct access to a restroom from the pool area. Guests have free use of a high chair and travel cot. Walt Disney World and a whole host of shops, restaurants, golf courses and other attractions are within 10 minutes drive, making this the perfect base for your dream vacation. Nearby are a Publix supermarket and a new Super Walmart supermarket for all your catering needs. 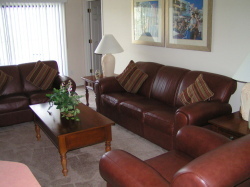 Other amenities include air conditioning and heating throughout, a large screen digital cable television in the family room with cable televisions in the master suites, DVD player, VCR and Stereo CD, computer, High Speed internet connection (DSL), books and indoor games. The private pool and spa overlooks a large landscaped area and ensures privacy without being enclosed, there are pool toys available for kids big or small. 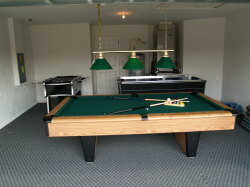 The villa has a top quality games room including arcade quality Air Hockey, Bar Football and Pool table. The large open plan fully fitted and equipped kitchen is next to the family room which has a luxury leather suite and space for everyone to chill out. There is a large dining table with seating for six and breakfast bar with seating for two. A BBQ is also provided free of charge to our guests. The family room gives direct access to the pool area. All doors to the pool have entry and exit alarms fitted to prevent young children having access to the pool area without their parent�s knowledge. All local, national and most international telephone calls are free. For peace of mind the villa is fully alarmed and this is monitored 24hrs a day by ADT. An electronic safe is available free of charge. The management company are available 24hrs a day to ensure your stay is enjoyable and without problems.